An early-Monday-morning shooting in Chicago’s Roseland neighborhood left a 66-year-old judge dead and a 52-year-old woman wounded. The gunman is still on the loose. 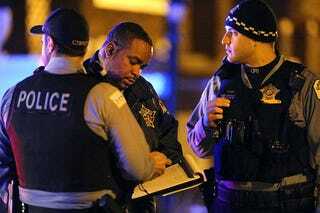 According to DNAinfo Chicago, Cook County Associate Judge Raymond Myles was killed just before 5 a.m. outside his home. The news site reports that investigators believe that the killing may have been the result of a robbery gone bad. According to the report, the woman left the house first and spoke to a man, who then shot her in the leg. The judge, upon hearing gunfire, left the home to investigate, also spoke to the man and then was shot four times. Chief of Detectives Melissa Staples described the woman as a “close associate” of the judge. It is believed that the two were headed to the garage together to go to work out at a gym when the shooting occurred. It is not believed that the woman knew the shooter. The woman had to undergo surgery as a result of the shooting. Although it is believed that the shooting may have stemmed from an attempted robbery, police say it didn’t appear that anything was taken from the judge or the woman. Police acknowledged that there has been a pattern of robberies in the neighborhood, but it is not clear if they are related to the shooting. Judge Myles worked at the Leighton Criminal Courthouse, the county’s main criminal courthouse. He had been involved in several high-profile cases, according to the report, including ordering William Balfour to be held without bail in the 2008 killing of three members of singer Jennifer Hudson’s family. Myles was attacked in the fall of 2015 after a driver hit his car, according to court records. Myles was taking photos of the accident when the man allegedly punched him in the face, causing injuries that required reconstructive surgery, DNAinfo notes. That individual is still awaiting trial. Currently no one is in custody for the shooting. I join all of the judges today in the Circuit Court of Cook County in expressing our sadness regarding the tragic passing of our colleague and friend, Associate Judge Raymond Myles. I offer my deepest condolences to his family, friends and colleagues in the Criminal Division. Judge Myles joined the court in October 1999 when the Illinois Supreme Court appointed him to fill a vacancy that he held for just over a year. The circuit judges appointed him as an associate judge in June 2001, and he has served in the Criminal Division since March 2009. Judge Myles joined the bench with a wealth of experience in law and extensive service to the community. I have always known Judge Myles to be focused and determined in the pursuit of justice, and his conduct earned him the confidence and respect of the people who appeared before him. All of our colleagues at the Leighton Criminal Court Building will miss Judge Myles, who they came to know for his kindness and his impartial administration of justice. Read more at DNAinfo Chicago.